What a year in the restaurant biz! So, what else is new? The past year brought massive movement in the restaurant business. And I mean that literally, given the new-digsification of Flying Fish, Mamma Melina, Marjorie, Szechuan Bean Flower (recently re-opened in Issaquah), Sitka & Spruce, Tidbit and Tat’s Delicatessen — with more in store in the coming weeks (hello, Lunchbox Laboratory South Lake Union!). 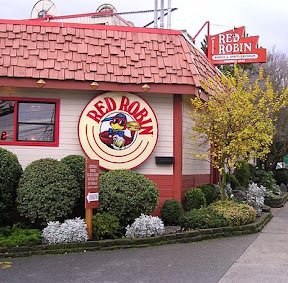 In 2010 we witnessed the closure of a trio of Seattle originals (the original Red Robin on Eastlake, the original Alki Bakery in West Seattle and the original Lombardi’s in Ballard). And we even got some originals back: witness the First Hill reincarnation of Vito’s and Mediterranean Kitchen, and of Phoenecia on Alki. The original Red Robin south of the University Bridge closed in March. 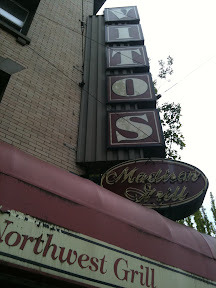 A revitalized Vito’s (seen in June, prior to its revitalization) reopened in September under new ownership. Economic woes shuttered promising newbies (Wallingford’s Avila, Capitol Hill’s Huiyona), forced fine-dining places to scale down and go casual (see: Lampreia = Bisato), and put the nail in the coffin of old-timers: among them the ID’s long-running China Gate and Ballard’s 71-year-old Totem House, which served its last fish and chips last week. Last year proved that Bellevue continued to be the place to open an Eastside twin (Monsoon East now shares the heart of old Main Street with the second coming of Cantinetta), though the Wild Ginger lost its Bravern neighbor, Artisanal (so you’ll have to go to the NYC original if you’re craving Artisanal’s fondue). Meanwhile, Fremont was the new hotspot for extending the family: all hail the December debut of Uneeda Burger (kissin’ cousin to Zoe and Quinn’s) and of Joule’s sassy sibling Revel (and its adjacent bar-room, Quion). 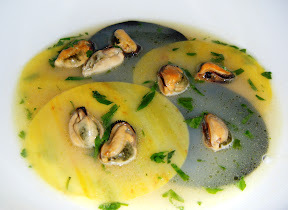 Mediterranean mussels with egg- and squid-ink pasta sheets at Bisato (left). 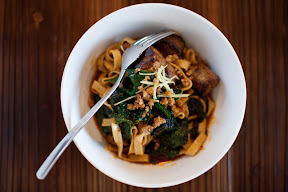 Five-spice duck balls with lacinato kale, smoked chile and noodles at Revel . There were breakups (at Harvest Vine) and shakeups (at the as-yet-unopened vegetarian high-ender, Kailash (more news on that as it unfolds). And, speaking of shakeups: just in case you were wondering, Terra Plata will open in the Melrose Market building, insists chef/owner Tamara Murphy. Latest ETA? “Spring,” she says. It’s set to join another fine-food purveyor in the redeveloped Melrose marketplace: Taylor Shellfish Farms, slated to open a bivalve boutique (OK, a retail shop), taking over the spot where the clothing gallery Velouria briefly stood. Got geoduck? Tayor Shellfish Farms plans to park a retail shop behind these papered windows, just a couple doors down from the main entrance to the Melrose Market and a few steps up the block from Terra Plata (storefront far left). Having happily rung in the new year, I’m here to say we have much to look forward to as 2011 unfolds, and I’ll be bringing you more of what’s in store here on the blog, as well as this Friday in a cover story for our entertainment section, Ticket. So stay tuned!